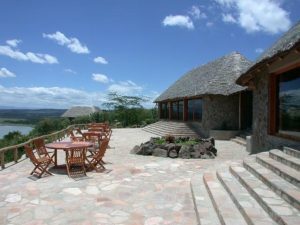 Sunbird Lodge, an eco-friendly luxury lodge is located in the Great Rift Valley, one of the natural wonders of the world. We are less than 127 km (1 ½ hours) from Nairobi and a few minutes off the new and superb Nairobi – Nakuru highway on a very good, private access road at the shore of Lake Elementaita, bordering and overlooking Soysambu Conservancy. Located on private land there are no park or conservation fees in addition to our very competitive rates. On excellent roads it is only 20 minutes to the famous Nakuru National Park and only a few minutes to Soysambu Conservancy where you can experience a balloon safari every morning. Located in the Great Rift Valley, one of the wonders of the world, on the shore of the “pink” Lake Elementaita, overlooking the vast plains of Soysambu Conservancy. Very small and exclusive – but affordable! TYPE OF ACCOMMODATION 14 luxurious and spacious en-suite Cottages, approx. 55 m² in size including and a large veranda with an unspoilt, spectacular view. PROPERTY CLOSURE PERIOD Open all year round. CHILD POLICY Children are welcome however due to the “Sunbird” nature of the lodge it is advisable to bring younger children only if they can be well supervised. For bookings cancelled or reduced in numbers between 45 and 34 days from the date of arrival, 25% of the contract rate will be charged. For bookings cancelled or reduced in numbers between 33 and 8 days from the date of arrival, 50% of the contract rate will be charged. In the case of cancellation within 7 days of the date of arrival, or in the case of a ‘No Show”, 100% of the value of the booking will be charged. In all cases, notification of cancellation is only accepted when received in writing and confirmed.